Eggland’s Best Celebrates Receiving Its 100th Award! 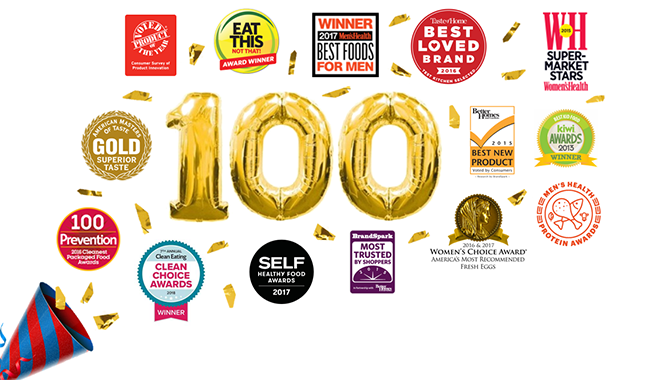 Eggland’s Best, the nation’s #1 egg, is pleased to announce that it recently received its 100th award for delivering the freshest, tastiest and most nutritious eggs to families across the United States. Prestigious publications such as Women’s Choice, Men’s Health, Prevention, and SELF have recognized the brand for having better taste, better nutrition and better eggs year after year, reaffirming the brand’s spot as the country’s top-selling egg. EB has also been the only egg certified by the American Vegetarian Association, and has been recognized by American Baby, Kiwi Magazine, Women’s Health and Product of the Year – just to name a few! The broad range of awards Eggland’s Best has received is a testament to the strength of the brand and the variety of great products available to consumers. From classic, cage-free, and organic shell eggs to the full Hard-Cooked Peeled Eggs line, EB offers customers innovative products that easily fit within their busy lifestyles. Compared to ordinary eggs, EB eggs contain 6x more vitamin D, 25% less saturated fat, more than double the omega-3s and vitamin B12, and 10x more vitamin E. EB eggs are also an excellent source of vitamin B2 and vitamin B5. The superior nutritional profile is due to the proprietary all-vegetarian hen feed that contains healthy grains, canola oil and a wholesome supplement of rice bran, alfalfa, sea kelp and vitamin E.
To learn more about EB’s awards and recognitions, visit www.egglandsbest.com/about-us/awards.